The front door opens into a lovely large lounge/dining room (47 Sqm). The old original open fireplace is retained with the hearth consisting of one huge granite slab with fireside seating. A wood burning stove provides warmth and character for off season breaks, and we supply the logs. 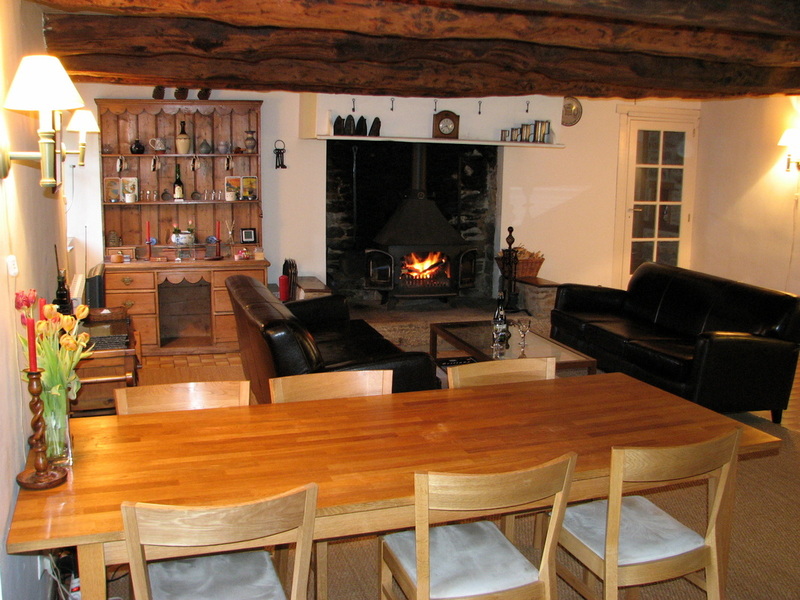 The original chestnut beams frame the roof of the lounge. Two large sofas seat six comfortably. A large oak table seats up to 8 persons. 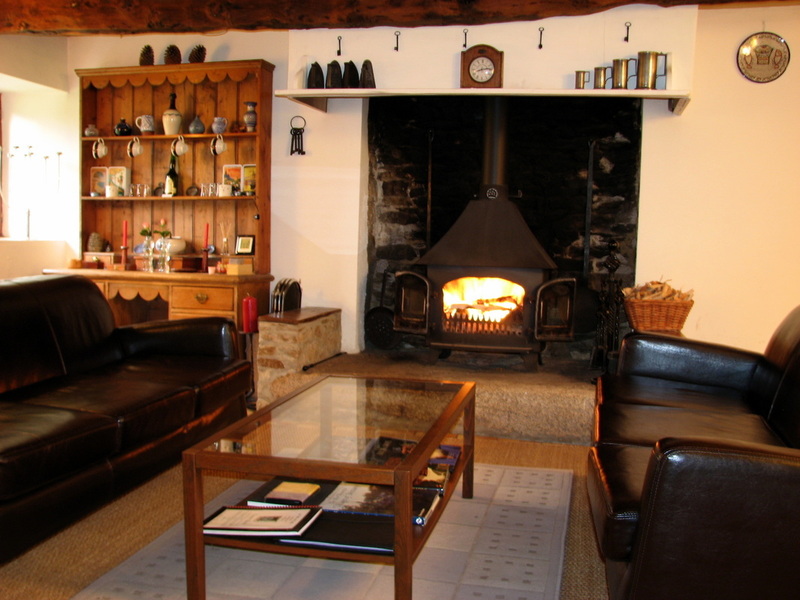 A 17" LCD TV/DVD player is provided to watch films when you can't tear yourself away from the log fire. The coffee table houses a number of large beautifully illustrated guide books, and there are some traditional wooden games to entertain you. The pine dresser contains an ample supply of scented candles. From the lounge doors lead off to the rear garden with gravel terrace and outside table and six chairs, and into the second lounge. We have installed a wood burning stove in the main lounge. We did love the open fire... but not the smoke, draughts, dust and the lost heat up the chimney! The stove is many times more energy efficient than an open fire and wood burning is CO2 neutral, so that is good for the environment too! After mulling the pros and cons of the situation we have succumbed to the many advantages of a stove. For off-season breaks, the wood burning stove provides a good heat (14kw). In addition, the longère has electric heating, which is a combination of six oil-filled thermostatic radiators downstairs, and individual thermostatic electric room heaters upstairs in each room. This means the cottage is warm and cosy even in winter. The kitchen is located in a separate room to the left of the lounge. 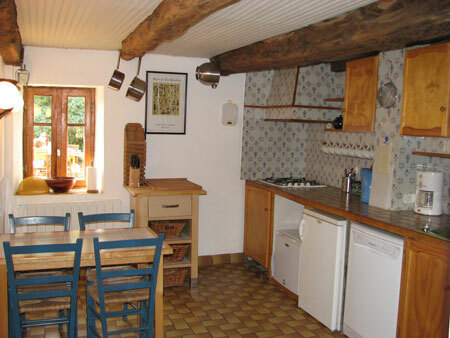 The kitchen has been fitted with French blue glazed tiles and handmade pine cupboards, while retaining the full length exposed beams, and in a style sympathetic to the age of the longère. It contains a 4 burner gas hob with extractor hood, full sized electric oven/grill, microwave, fridge, freezer, dishwasher, double bowl sink, wine rack, and a breakfast kitchen table with four chairs. Quality crockery and utensils are provided together with cast iron Le Creuset cookware. We supply all the kitchen utensils you need including electric scales, blender and whisk, garlic press, cheese knives, steak knives etc. If you fancy making some crepes, we even have a cast iron crepe/galette pan. We supply washing up liquid, dishwasher tablets, kitchen foil, cling-film, salt/pepper, olive oil, and most things you would expect to find in your own kitchen. 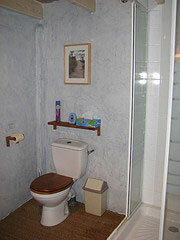 A toilet with hand basin is located off the kitchen. The light and airy sunny TV Lounge is entered from the main lounge. This part of the longère forms a separate guest wing which can only be accessed at the ground floor level, which makes it ideal for sharing couples or relatives as it offers a greater degree of privacy and independence. This pine beamed lounge is equipped with a 26" LCD TV/DVD, Sky FreeSat TV and a good supply of DVDs to appeal to both children and adults. A micro hi-fi plays radio, CDs, & MP3s on USB pen drives. An iPod dock can be used to play and charge iPods & iPhones (up to iPhone 4). There is an oak sofa-bed that can sleep a child if required. A games box contains a good selection of indoor board games. You can use our laptop to access your emails or surf the internet via free WiFi, or you can bring your own. Large double windows look out over the front garden, and a high level side window gets the morning sun and has views of the surrounding fields. 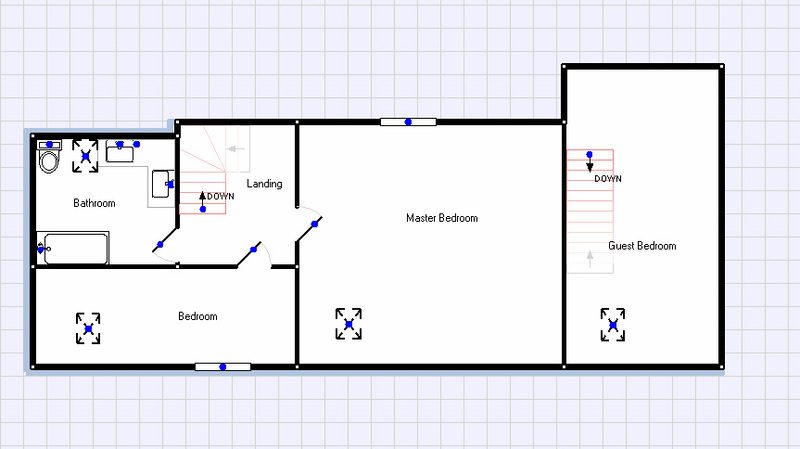 A door leads from the rear of the lounge to the second bathroom/utility room, and stairs lead up to the third bedroom. 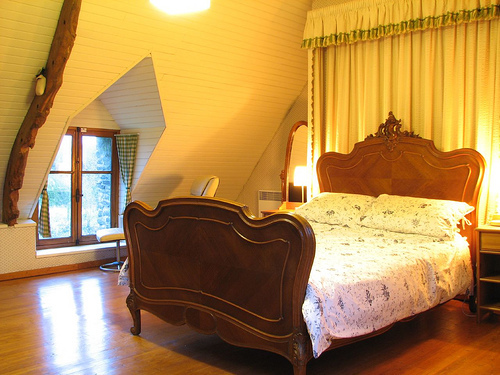 The delightful large Master Bedroom is light and spacious (32 Sqm) with the original exposed beams and an antique French Louis XV style walnut bed. A quality mattress is provided to ensure a good nights sleep. 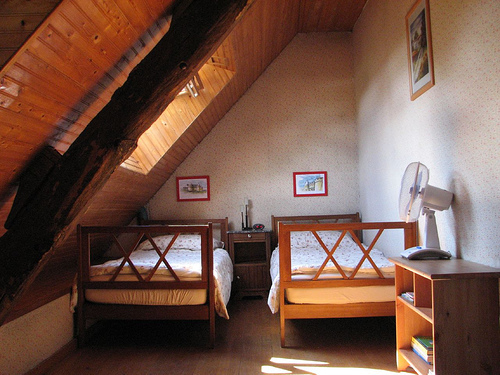 There are twin bedside tables with lamps, alarm clock-radio, large chest of drawers and a large wardrobe. A reclining leather chair and footstool provide a relaxing spot to read a book or just enjoy the view of the rear garden through the dormer window. 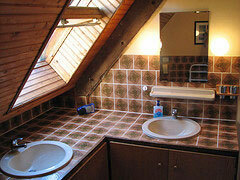 There is also a Velux window with views to the front garden. A cot with mattress are provided. The Master bedroom has walls upholstered in Laura Ashley type floral fabric - very French! A curtained canopy frames the bed adding a stylish touch. The roof is clad in pine lambris, painted antique white. 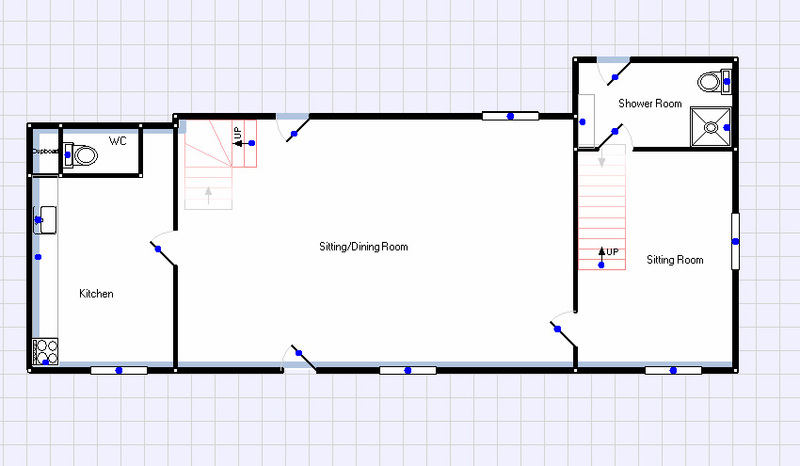 Many similar properties have sub divided the space to create two smaller bedrooms, but we much prefer to retain one large impressive bedroom. 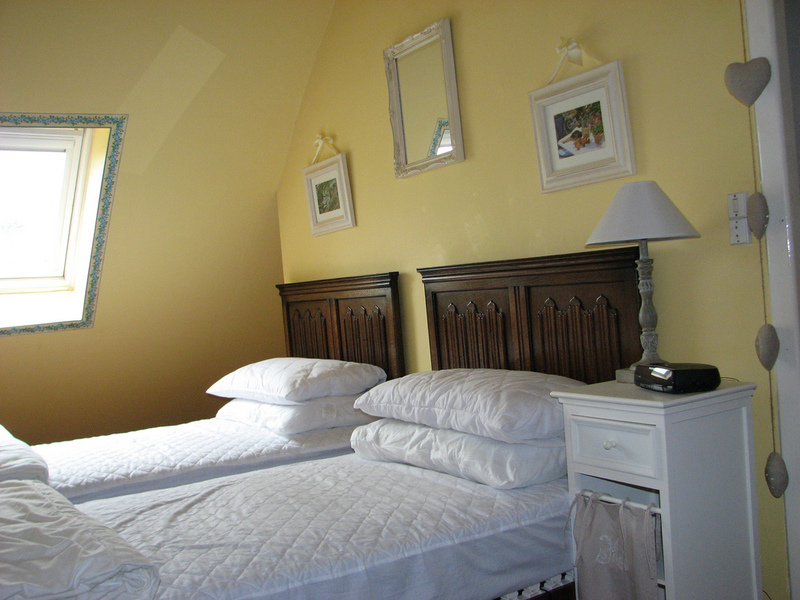 The Goose Bedroom is a long narrow room at the front of the cottage under the eaves, with a low level dormer window and a Velux window with views to the front garden. This room contains two single beds with comfortable mattresses, a bedside table, bedside lamp, Sony alarm iPod dock clock-radio, chest of drawers, chair, and room fan, together with the Goose night light that gives this room its name! 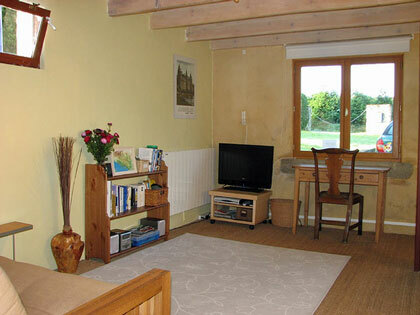 There is a thermostatic electric radiator and a wardrobe is located just outside on the landing. A traditionally decorated tiled family bathroom contains a large bath with thermostatic shower, toilet, twin hand basins, and Velux window with view to the rear garden. The third bedroom is accessed from a separate staircase in the TV Lounge and contains two oak linen fold single beds with comfortable mattresses, bedside table, bedside lamp, alarm clock-radio, fan, large chest of drawers and a wardrobe. This room has a Velux window (with black-out blind) providing views to the front garden, and countryside beyond. Accessed from the rear of the TV Lounge is a shower room and utility area containing a shower cubicle, toilet and hand basin. The washing machine is also located here. There is a thermostatic electric radiator. A door leads out into the rear garden.